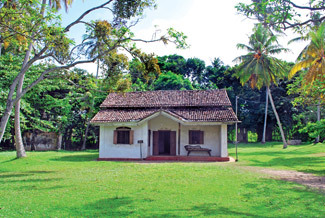 Martin Wickramasinghe was born in the year 1890, on the 9th of May, in Koggala, a Southern coastal village in Sri Lanka. As a village boy Martin Wickramasinghe first learnt Sinhala letters from an ola leaf alphabet, tracing the letters on a sand-board. After two years of tutelage under the traditional village guru, he attended Buona Vista School in Galle, the capital of the Southern Province. Due to a change in family fortunes he had to leave school at the age of 10. However, he continued to acquire his educational and cultural background by intense personal inquiry and reading. Even as a boy, the diversity of fauna and flora in the village hinterland bounded on one side by the beautiful expanse of the great Koggala lake, and on the other by the coral fringed sea, aroused his interest. The entrancing coral reef, teeming with marine life, was only a half mile away from his home. He was puzzled by the strange plant-like forms of the marine animals he observed on his frequent visits to the coral reef. These experiences of his boyhood kindled his curiosity as to the nature and origin of living things and the world. Despite his lack of formal education, his inquisitiveness led him to read widely. He was a youth of 18 when he became acquainted with the Darwinian theory of evolution, through a paperback edition published by the Rationalists Press Association of England. The insights into life and nature acquired in the background of these early years was the springboard for Martin Wickramasinghe's sustained and intense intellectual inquiry, and his creative and critical writings relating to the life and culture of the people of Sri Lanka which he continued unbroken for a period of over 60 years. An American critic, Prof. David Jackson of the University of California, has said that Martin Wickramasinghe can be compared to a generation of self-educated writers from village, rural or regional origins who have brought about the modernization of their national literature. At the same time, Martin Wickramasinghe has pointed to the living roots which Buddhism has nurtured in our folk culture as the source which can continue to nourish our national identity and national sensibility through the vicissitudes of modernization. Wickramasinghe has written and published 85 books in all. His first book written at the age of 20, and published a year later, was a polemic influenced by English rationalism and 19th century cultural anthropology. In 1934 he wrote and published his Satva Santatiya, a comprehensive book on the theory of evolution. This book has been the foremost contribution to the popularization of the theory of biological evolution and the scientific outlook in this country. He revised it in 1960 to incorporate modern concepts on heredity and evolutionary theory. In 1946, Martin Wickramasinghe published his 'Development of Sinhalese Literature', a critical study of classical Sinhalese literature, which revolutionized the old theories and methods of study of our language and literature. The new canons laid down by him have continued to stand the test of time. Amongst Wickramasinghe's novels in his trilogy 'The Uprooted' (Gamperaliya), 'The Age of Destruction' (Kali Yugaya) and "The Final Age" (Yuganthaya). Gamperaliya is the landmark in the development of modern realistic novel in Sir Lanka. This trilogy has been acclaimed as a major work of creative fiction both nationally and internationally. A leading Russian critic Kochitove has reviewed the remarkable similarities both in stature and theme between Martin Wickramasinghe's novel published in 1944, in Sir Lanka, and Di Lambedusa's 'The Leopard' published in Italy in 1953. The story revolves round a rural Sinhalese family with feudal traditions, the Kaisaruwattes, and three generations of their descendants. The second generation seek their fortunes in the capital city of Colombo, at the beginning of the 20th century. The microcosm of the domestic world of the Kaisaruwattes and their descendants, which mirror the change in human relations and values against the larger canvas of rapid social, economic and cultural transformation in the country, is depicted with sensitivity and disinterested sympathy. Through the stresses. Conflicts, and vicissitudes in the lives of men and women who appear in the pages of Wickramasinghe's trilogy we see the gradual dissolution of a well-knit but decaying traditional way of life on the one hand, and seeds of alienation and fragmentation in the emerging dynamic westernized urban society, on the other. Martin Wickramasinghe's creative writings include a large number of short stories. The psychological realism of these short stories has been compared to that of Chekhov. It is the view of many critics, both here and abroad, that some of his short stories, such as Vahallu (Slaves) are masterpieces. 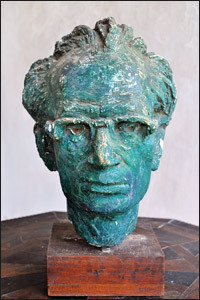 During a period of over 60 years of literary activity Wirckramasinghe wrote and published in Sinhalese 10 novels, eight books of short stories, two books of auto-biographical sketches, four plays, a rendering in Sinhala blank verse of a collection inspired by the Pali psalms of the Buddhist nuns (Theri Gatha), and 23 books of critical studies on Sinhala literature, culture and language and Buddhism. He has also written and published nine books in English. Among them are 'Aspects of Sinhalese Culture', 'Buddhism and Culture', 'Buddhist Jataka Stories and the Russian Novel, 'Buddhism and Art', 'Sinhala Language and Culture', and 'The Mysticism of D.E. Lawrence. His autobiography was published in 1961. His study of Russia and the classical Russian novel, and the development of the Soviet Union after the 1917 revolution, published in 1962, was awarded the UNESCO prize. Between 1965 and 1968 he wrote and published two books in Sinhala on the aesthetic aspects of the novel. A new metaphysical interpretation of the Buddhist theory of Karma and Rebirth, which provoked much comment, was published in 1967. His last major work of fiction, which was written at the age of 84, was the novel Bhava Tharanaya. This imaginative work set in the time of the Gautama Buddha, is the culmination of Martin Wickramasinghe's historico-critical approach to the life and teachings of the Buddha, which he developed from extensive studies in Buddhist literature and Buddhist philosophy. It has become one of the most controversial books in the literature of Sir Lanka. As a liberal intellectual who consistently attacked dogmatism, obscurantism, oppression and elitism from any source, religions, political or social, Martin Wickramasinghe has been the centre of controversy throughout his life. His liberalism and independence primarily nurtured in the humane, intellectual tradition of Buddhism, developed further in its sociological dimensions under the impact of the Western intellectual tradition and science. Martin Wickramasinghe has pointed out that Karl Popper's definition of the European Scientific tradition as a tradition to question tradition is exemplified in the Buddha's Kalama Sutta, although in Buddhism it was used to explore the noumenal (intuitive) knowledge rather than phenomenal knowledge. The permanent value of Martin Wickramasinghe's literary work has been acknowledged both nationally and internationally. Doctorates have been conferred on him by four Universities in Sri Lanka. He was invited to travel to and lecture to audiences in countries in Asia, Europe and Latin America. Translations of some of his major works of fiction have been published in many languages. Martin Wickramasinghe died following a short illness on the 23rd of July 1976, in his 87th year.